New Generation GO Alive - Welcome to the next generation of school supplies where school supplies and fun go hand in hand. This new line of interactive notebooks combines classic creative with cutting edge augmented reality technology , to bring your notebook to a magical animated show ! Keep your kids entertained with fascinating animation sequences that they become on your notebooks. Interactive prompts let kids in the action , helping then control what they see on the notebook. Cool characters , amazing animals and fun facts make yours notebook come to life like never before! IT's As EASY As 1-2-3 1) Download and launch the FREE App from the APP store all instructions are at the back of your product also by the email that will follow with your order. 2) Hold your device over the New Generation GO Alive notebook graphic. 3) Watch the your notebook come to life , interact with it and watch all over the notebook to see the magic , HAVE FUN ! New Generation brands main mission is to enhance your creative , academic and business days with an eclectic, and high quality art and craft , stationery products. New Generation is owned by NC Consulting Corp. who began as a family owned business 40 years ago. Today and going forward, we are humbled and eager to keep inspiring, help our customers meet their daily tasks and above all, bring a smiles to their faces. We continuously look forward to hearing from YOU as to how we can uplift your day-to-day through our creations. MAGICAL NOTEBOOKS - Welcome to the NEXT Generation of School Products where School and fun go hand in hand. FREE APP - iOS & Android App INCLUDED - Make your School Products GO Alive ! 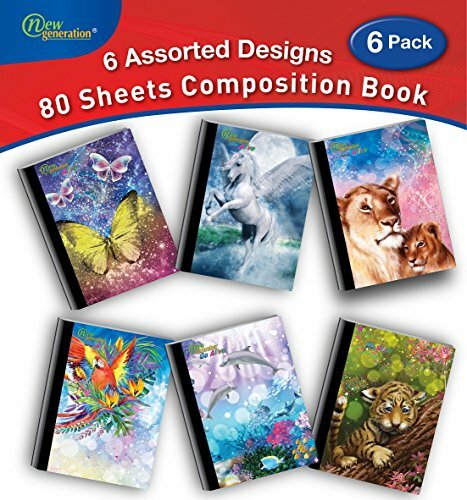 ONE SUBJECT - Back To School Value Pack ,80 White Sheets Subject WIDE Ruled Composition Book ,7.5 x 9.75 inch sheets size . MADE TO LAST- Durable Heavy Duty with Glitter Hard Covers - 100% Satisfaction Guarantee. PERFECT FOR SCHOOL - Each includes a Class Schedule ,Also includes an useful information matrix inside the back cover! If you have any questions about this product by New Generation go Alive, contact us by completing and submitting the form below. If you are looking for a specif part number, please include it with your message.